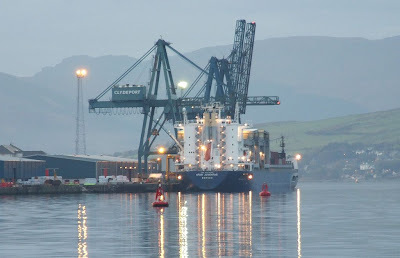 One of Star Shipping's palletised woodpulp open hatch cargo ships arrived at Greenock this afternoon, having loaded on the western seaboard of North America a month ago, and passing through the Panama Canal on 5 October. STAR JUVENTAS joined the fleet in May 2004, and was built at the Mitsui Engineering and Shipbuilding Company's yard at Tamano in Japan. Actually owned and managed by Grieg Shipping, a Norwegian company, like many of Star's fleet she is on long-term charter to them. This particular ship is 198.0 metres long, she has a deadweight of 44,837 tonnes and a gross tonnage of 32,679 tons. Once she has completed cargo operations at Greenock, she will sail for Flushing and Brake. just saw the boat on Savannah GA!